The reason for the delay was as a result of strike action embarked upon by cabin crew members on Friday morning without prior notice. Frustrations, complaints and disappointments are the best words to describe the feelings of passengers of Arik Air as they could not fly at scheduled time. The passengers headed to the airports to catch their local flight only to be told activities have been grounded. The cabin crew members are protesting over what they termed "non-increment of their salaries and allowances." 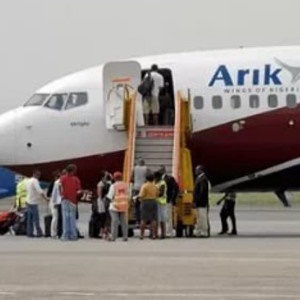 The crew are also demanding for allowances that hitherto applied when Arik Air operated long-haul routes like New York, London and Johannesburg. It is learnt that when those flights were happening, a crew member could accumulate between 100 and 120 flying hours which came with special bonuses and special allowances. For instance, the New York flight attracts $100 allowance per night, while the London Flight attracted 60 pounds per night, times the number of nights spent abroad. Bounce News learnt the strike, which is happening nationwide, is most effective in Lagos and Abuja airports. As at 10am on Friday, hundreds of passengers were stranded at the Nnamdi Azikiwe Airport in Abuja and Murtala Muhammed Airport in Lagos. The airline has already announced two hours delay on all its flights on Friday, with the believe that negotiation with its aggrieved crew members could be concluded in record two hours. But if the negotiations linger, then more delays will happen.